Bolton: "I always enjoy working with ZOA. It is an incredibly effective advocate for a strong US - Israel relationship." 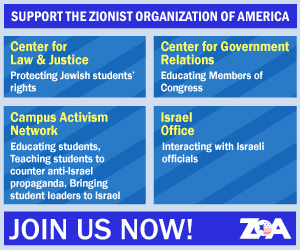 On Sunday evening, May 3, 2015, a huge crowd of almost one thousand people attended a major public event of the Zionist Organization of America Long Island-Queens region (ZOA-LIQ), featuring former U.S. 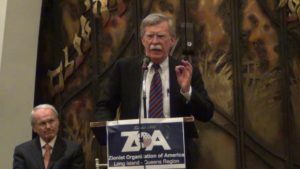 Ambassador to the United Nations and foreign policy expert, the Honorable John R. Bolton, who was introduced by ZOA National President Morton A. Klein. The Great Neck Synagogue (GNS) Men’s Club joined with ZOA-LIQ to host this event in the beautiful GNS sanctuary. ZOA officers Martin Sokol, Dr. Alan Mazurek, and Great Neck Synagogue Men’s Club President, Hilly Milun also spoke. ZOA also gives special thanks to Dr. Alan Mazurek, Martin Sokol, David Schimel, Esq., and David Neinken for all their help in making this important event possible. During their speeches, Ambassador Bolton and ZOA Pres. Klein received repeated standing ovations from the large, enthusiastic crowd. ZOA President Klein noted the very serious, dangerous, frightening times we live in, particularly due to Iran, and asked the audience to join with ZOA, to strengthen ZOA’s voice on Capitol Hill, in the media, and on campuses, and among Jewish communal leaders who still support a terrorist Palestinian Arab terrorist state and still complain about the Jews living on just 2% of the land in Judea and Samaria – falsely claiming that this is the primary cause of the ongoing Arab war against Israel. Mr. Klein especially appealed to Great Neck’s Iranian Jewish community to join with ZOA, as the Persian community understands better than anyone that the Iranian regime is a rogue terrorist regime that seeks to destroy Israel and, if possible, America, to fulfill their religious beliefs to bring about the twelfth Imam’s arrival and worldwide Muslim rule after a catastrophic war. Klein urged the audience to tell their Congressmen to stop the disastrous Iran deal, and to support Israel if Israel needs to take military action to stop Iran from obtaining nuclear weapons. Ambassador Bolton described how the U.S. administration’s policy of diminishing American power and influence is contributing to chaos, disintegration of former countries throughout North Africa and the Middle East, and instability around the world. He cited various examples including Russia’s aggressive moves in Ukraine, ISIS’s growth, Boko Haram terrorists subjecting three countries to breakdowns, terrorists almost overwhelming Mali’s government, Libya’s disintegration into a country ruled by competing groups of terrorists and warlords, etc. Ambassador Bolton also described the uselessness of sanctions. For instance, he explained that despite five decades of sanctions against North Korea, an impoverished, isolated country that lacks resources, North Korea has detonated 3 nuclear devices, and our commanders believe that North Korea’s nuclear program is on track to miniaturize a nuclear device to fit under a ballistic missile nose cone to reach the west coast of the United States, within a very short period of time. Ambassador Bolton explained that although the Iran sanctions caused some economic hardship to Iran, the sanctions imposed on Iran were far from what might theoretically be effective. The Iranians sanctions have been piecemeal, targeted against named individuals and companies, which spring up again using new names and aliases within a manner of days; not adhered to by some of Iran’s critical trading partners; and violated with impunity from the day they were enacted. Oil is coming out of Iran through the Kurdish areas into Turkey, and through Iraq. Moreover, the Iranian sanctions are being violated on a routine basis, and are not being enforced, as negotiations with Iran have proceeded over the past two years. Ambassador Bolton noted that Director of National Intelligence James Clapper testified last year that the sanctions against Iran have not slowed down Iran’s nuclear weapons program one iota. The Ambassador advised that there are only have two possible outcomes: either Iran will get nuclear weapons and a Middle East nuclear arms race will quickly ensue – or someone will stop Iran before Iran crosses the nuclear finishing line. Since no one believes that the U.S. President will act, the burden will unfairly fall on Israel. It will difficult and costly in terms of men and material for Israel to strike, but not impossible. The United States could do the job more thoroughly. A lively question and answer period moderated by Dr. Alan Mazurek followed, during which Ambassador elicited cheers and a standing ovation when he stated that he was considering running for president. “President Obama’s first speech on foreign policy was at the Muslim Brotherhood University in Egypt. Mubarak begged him not to go there and not to invite the Muslim Brotherhood, telling Obama that he, Mubarak, could not come if he does. Obama invited the Muslim Brotherhood, and Mubarak did not come. President Obama made speech after speech demanding that Mubarak, an ally of the US, leave office, screaming, supporting the people who were demanding his [Mubarak’s] overthrow. But when Ahmadinejad had hundreds of thousands of people in the streets, President Obama was asked to support the people in the rallies to get rid of Ahmadinejad. Obama said it is an internal matter, I won’t do it. When Prime Minister Netanyahu simply said that under these circumstances, a Palestinian State is not possible, for weeks Obama attacked him. Yet, when Iran, throughout negotiations calls for death to America, death to Israel, says that the United States is the number one enemy of Iran, Obama says nothing. President Obama refused to attend the rally against Islamic terrorism in France, one of the only major leaders who wouldn’t go – he also refused to send to this rally Vice President Biden or Secretary of State Kerry, who was in Paris at the time. Top Obama aide Valerie Jarett called it a parade. Obama refuses to use the term Islamic terrorism in any of his speeches, and is also eliminating Islamic terrorism from the military manuals and from the State Department reports. Obama has released numerous Islamic terrorists from Guantanamo prison who are officially designated as high risk for future terrorist attacks. Muslim Brotherhood members have had regular meetings at the White House and National Security Council. During Obama’s 2008 campaign Obama spoke of the need to deal with the “legitimate claims of Hamas and Hezbollah.” (New York Times reported May 16, 2008). He repeatedly fought against imposing sanctions on Iran. I could go on and on. Isn’t what I said enough evidence that this president is not naïve, is not incompetent, but is sympathetic to and tolerant of radical Islam? Dr. Alan Mazurek asked: The president has threatened to withhold the veto in the UN. What do you think will happen? Bolton answered: This is an attack on Israel’s very legitimacy because it is saying that Israel’s right to protect itself is somehow impermissible. It is only the American veto that protects Israel against resolutions to that effect. So if the president stands back and allows one of these resolutions to be adopted, we would be back in the days of Zionism is racism. And that would be a catastrophe for all the obvious reasons. It speaks to the president’s antipathy towards Israel. It’s not something about Bibi Netanyahu. If Obama doesn’t like Bibi, be a professional and get over it. It would be a direct assault on Israel, and people should understand that. Question: There is a lack of leadership in the country. Can you start your campaign towards the presidency tonight? If Hillary wins, how do you feel she would treat the rest of the world? Answer: One of the things that personally dissuades me is that I’m not wealthy, but one of the things that may bring me into this is the opportunity to debate Hillary. Hillary was one year ahead of of me in law school. She was a radical then, and is a radical now. She doesn’t have any problem getting to the left of Elizabeth Warren. Her Hard Choices book shows no differences from Obama. She is in the same place politically as Obama. Question: What do you think the Iranian response would be in the aftermath of an Iranian nuclear attack, and what would be the ability of the Iranian government to persist after a military attack. Answer: Any attack should be accompanied by a policy of regime change. The difficulty of knowing how Iran would respond is one of the most difficult decisions that the Israeli government is to make. Iranian government has a certain element of irrationality, and this makes things hard to predict. They will probably not want to involve the US by closing the straits of Hormuz or increasing attacks against American targets. The most likely response is to unleash Hamas and Hezbollah to rocket Israeli civilian targets. Most observers believe there are already Iranian revolutionary guards personel in the Bakaa valley with fajr missles and others. I don’t believe that Operation Protective Edge destroyed all the fajr missiles that are buried underneath Gaza. I believe that Hamas and Iranian personnel there will be able to get the fajr missiles out of the deeply buried tunnels there, where they are stored. It is so important for America to resupply Israel with F16s. Israel will need to immediately establish air superiority over Lebanon and the Gaza strip. They should have that at the same time they are attacking the Iranian targets.